After our great successful premiere of flights from Sisimiut on July 26th, we returned on the 10th of August. This time we doubled the number of guests with a total of 39! Eight departures were conducted. Along with a great cooperation with Greenland Cruises, guests from German cruise ship Aida were being transported directly to the airport terminal were our pilot greeted the exited guests. Despite a bad weather forecast on the previous day, luck seemed to be on our side, with clear blue skies all along the route, with a perfect view of the snow covered mountains. 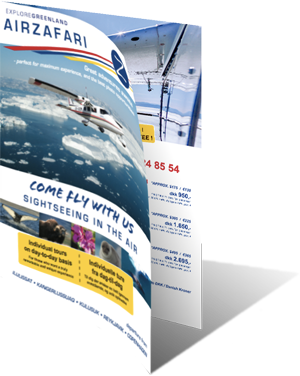 Get an exclusive interior view from one of our flights in beautiful Sisimiut on a sunny September day. Mountains, glaciers, and ocean view is complimentary :) Music by © Cam - "Burning House"
Temporary "flying siesta" can occur! We fly all day, you decide!